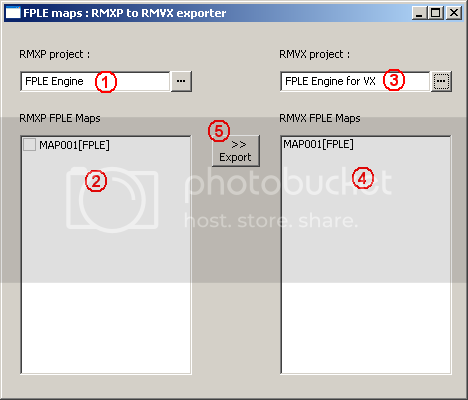 As the mapping in RMVX is not suitable for the FPLE script, here is a solution to import FPLE maps created with RMXP directly in a RMVX project. The following file contains a VX demo, and an executable (exporter). This script is complex, requires a DLL, so you have to download the demo to get the script. Only the three layers (floor, walls, ceiling) will be imported from RMXP. Events and maps properties shall be set in RMVX. To begin with, you must have a RMXP project with FPLE maps (see FPLE script for RMXP). You don't need to put events, that is just useless here. You must also have a RMVX project that includes the FPLE script for VX + the DLL (see demo). - if the map's name matches an existing RMVX map's name, then the map is updated (only the layers, it doesn't erase your events). - if not, a new RMVX map with the exported map's name is created : you will have a new MapXXX.rvdata file in your Data folder, plus a MapXXX_FPLE.rvdata file. The MapInfos.rvdata file is also updated. - Tilesets data are copied : Tilesets.rvdata is created/updated and a new folder "Tilesets" containing FPLE tilesets is created/updated. Imported FPLE maps in RMVX are displayed in the editor using void tiles where there is no wall and black tiles for walls. That's completely arbitrary and has no importance : the mapping in RMVX has no effect on the map's rendering. It's just a helping tool to place your events easily. I'm using vgvgf's rewritten Table class, so he should be credited. Is there a version of this that will work with RPG Maker VX Ace? I didn't plan to make a version for RMVX Ace for the moment. Is there some kind of workaround so that I can (in so many steps) get my XP maps into Ace? An exporter based on this one for VX should be fairly easy to make. However the main problem is that the DLL is not compatible with ruby 1.9. So until I modify the DLL there is no way that Ace could handle FPLE maps. Hmmm... do you have any idea when that will happen?